1200 Some Miles: Nap Time? Alex was a great napper for about two and a half years. He did not drop his morning nap until after his first birthday, and afternoon nap time was sacred for a long time. He was the child who napped well at daycare and at home. Sometime in the fall, Alex started doing ok without an afternoon nap. We did not mind that he missed a few naps to attend UTSA football games. Still, he took a nap most days. By Christmas, nap time became more difficult. He still napped at daycare but for a shorter time. Now, I have about a 5 minute window where I can get him to take a nap. If I miss that window in the afternoon, too bad. Alex may be ready to drop nap time, but I am not giving up easily. If we don't have nap time, then we at least have quiet time. Trust me, I need quiet time just as much as Alex needs it! Photo from 1/12/12. 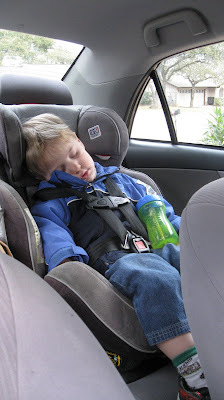 Alex fell asleep in my friend's car when she watched him for the afternoon. Don't they look so sweet and innocent when they're sleeping? !